July 17, 2018 | -by: Kevin George. Email marketing, if not kept engaging enough with your subscribers may hit a stale spot, and that calls for extra effort than the usual practices you follow in email campaign management. It’s stated that roughly 60% subscribers in an emailing list are inactive at any given time. Re-engaging them helps you bring them out of inactivity (owing to whatever reason), back into sales funnel and eventually contributing to the revenue generation. Till the subscriber has not unsubscribed, it is not the end of the world. By analyzing your data, generating insight, figuring out what they want either by running a survey or feedback, you get to know what they want and have a chance to bring back. Unfortunately, before you start your efforts to winning back your subscribers, it is important to understand what the reason for inactivity may be. Cluttered inbox: The email is lost in the flood of other subscribed email and the subscriber is unknown about it. Change in preferences: The subscribers’ preferences and requirements have changed but they are lazy to unsubscribe. Freeload on information: The subscriber just wises to connect with the brand & competitors but is not interested in making a purchase. Save it for later: The subscriber has put your email on the snooze list and plans to read your emails on a later date. Too high sending frequency: You may not have clearly specified your sending frequency during the sign-up process and now the subscriber is overwhelmed by the sudden influx of the emails. Weak or non-actionable subject lines: Most subscribers open the email based on the effectiveness of the subject line. Signed up for one time offer: The subscriber was lured by the lucrative discount you offered during sign up process, but they stopped engaging after that. Bad Experience: The subscriber had a bad experience and stopped opening your emails. The experience might be based on a broken email design or a bad online experience. While working with our 5000+ client base, we ensure that every email template built are compatible and render perfectly in 40+ email clients. For this, we have some rigorous QA in place too, and that’s what make our customers trust us when they have the need for a perfect PSD to email template. As you can observe, the reasons for inactivity can be different and so will the strategy to win them back. The message, the frequency, the offers, the design, the CTA will change in each case. Let’s understand why it’s important to revive the inactive email subscribers. Calculation shows that it costs 5x to acquire new customers as compared to retaining an existing customer. And 81% of marketers agree that email is the most reliable channel for customer retention. Even if you don’t consider it from the revenue point of view, having inactive subscribers in your mailing list is like cutting the branch on which you are sitting. Your subscribers not opening your email leads to a drop in the engagement for your email, directly translating into poor sender reputation and in turn poor deliverability. In fact, ISPs take note of inactive email addresses and after a pre-set duration of inactivity, convert these email address into SPAM traps. Moreover, by sending emails that you know your inactive subscribers won’t open, you are wasting precious resources on them. This is especially applicable when your ESP charges you based on the monthly send volume. Having a re-engagement automation set-up is an important step in email campaign management workflow. The success of an email marketer depends on how well they can monitor the progress of a customer in the sales funnel and enhance their experience by modifying the emails as needed. If you are looking to learn the ropes of email campaign management for your Win-back campaigns, this ebook on Campaign Management could be a great asset. How to keep your customers engaged. Defining inactivity in your email campaign strategy is very important as your approach will change depending on your win-back being customer-centric or subscriber-centric based. A customer-centric approach will focus on those inactive subscribers who are opening your emails, may or may not be clicking on the CTA but haven’t purchased anything for long. The end goal of a customer-centric approach will be to motivate the subscriber to make the purchase. A subscriber-centric approach will focus on those inactive subscribers who are not opening your emails. The end goal of a subscriber-centric approach will be to motivate the subscriber to open the emails, change their preferences or (last straw) unsubscribe. Next comes the duration of no activity to be qualified as an inactive. This depends on your sending frequency (for subscriber-centric) / last order (for customer-centric) and varies from industry to industry. Now that you have a clear understanding of which of your inactive subscribers are worth winning back. For a subscriber-centric approach, those inactive subscribers who have not opened previous 5-10 emails are a prime target for re-targeting. For a customer-centric approach, the baseline condition is based on the order value. If someone made high-order purchases in past and gone inactive, they are more relevant to return compared to those who made only a couple of purchases in past. Winning back your inactive subscribers is a step-by-step process where you need to implement a strategy that starts with your inactive subscribers opening your emails at the very least. Once they open the email, the copy needs to solve the reason for inactivity and prompt them to click the CTA. Let’s move to resolve the issues in each stage one at a time. Subject lines and pre-header text are your biggest bet here. It needs to be actionable words such as “Come back, we miss you” or “Is this over?” to motivate your subscribers to take note. Research suggests that using a shorter subject line is more effective in win-back emails. Research from Return Path showed that using the words “miss you” in a subject line achieved a 13 % read rate, and messages with the words “come back” in their subject lines achieved a 12.7 % read rate. Check out the following Father’s Day subject lines. Congratulations! If they open your win-back email based on the subject line; this means that a ray of hope still exists, and it is time for your email copy to shine through. 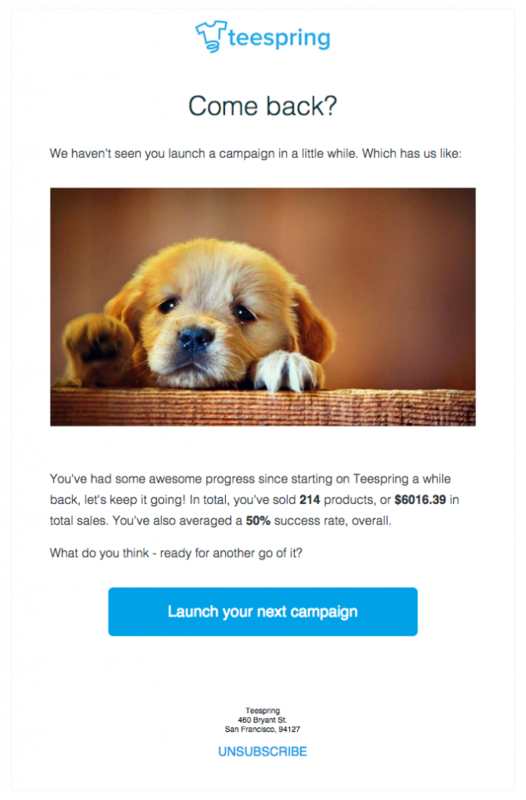 You can either try to win them back with an incentive or tell them to update their preferences to receive better-tailored emails. Ask them if they are still interested in being part of your list. In the above example, the sender has introduced himself and then proceeds to ask the important question. The subscriber has the choice to either be subscribed or be left alone with two different links. If the subscriber was active in the past, use the data to send them personalized email content. Personalized emails deliver six times higher transaction rates, so it’s worth tailoring content to subscribers – even inactive ones. The effectiveness of your email copy is measured on the clicks on the CTA button of your win-back email. Those who are inactive are not going to readily check out all products that you got to provide, as soon as you send a re-engagement email. So, one golden rule for CTA in a re-engagement email is ‘ONLY ONE CTA’. Following brands have not only featured a single CTA button, they have managed to innovate it. Return Path’s re-engagement has two giant animal heads for the subscribers to choose. The copy supports the overall flow. Ticketfly’s re-engagement email gets you as soon as you open it. A heart touching GIF in the first fold, empathetic email copy is doing their work excellently. Moreover, they have added what has changed since the subscriber has become inactive. A great email design by Polyvore. The minimal text manages to convey the message effortlessly and the CTA is very subtle yet visible. Great! They are back in your sales funnel. Now you need to make sure that they are not going inactive in a while. In case they do, it is an indication that your regular content is not engaging enough and needs improvement. Give a collection of offers that makes it difficult to say NO! 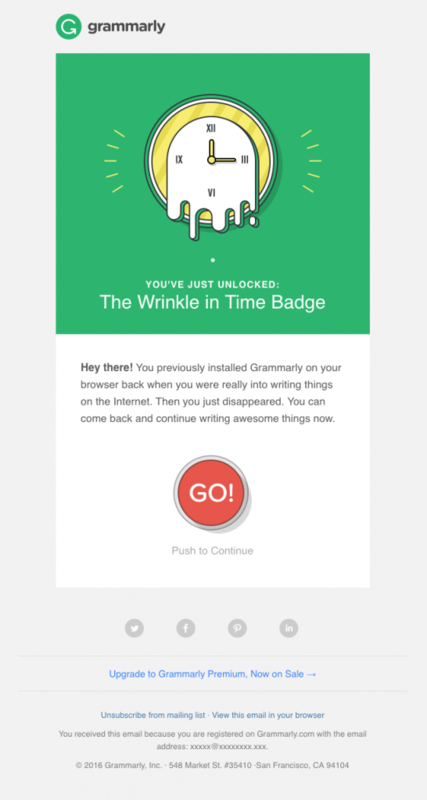 Looking forward to creating awesome reengagement emails? Monks can help.